Last Monday, Growing Book by Book showcased some fun read-alouds centered around love, caring and sharing. 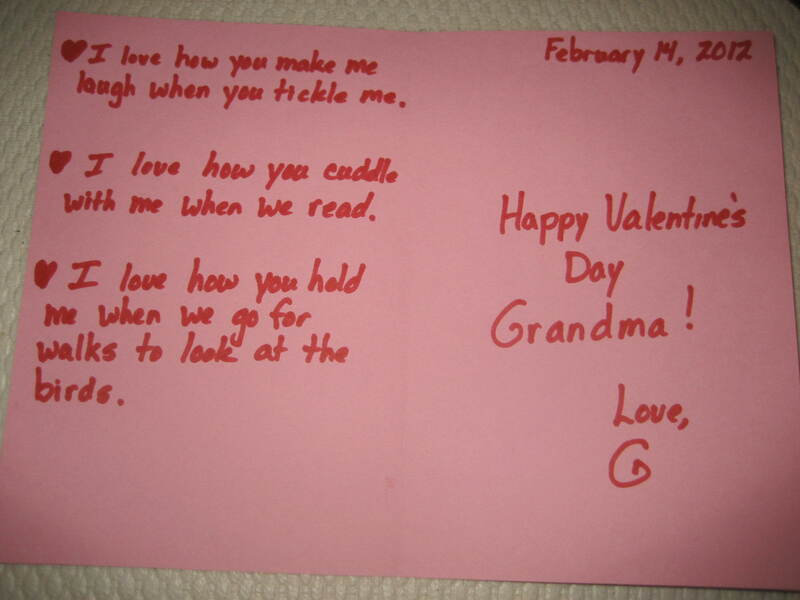 Today, we are going to look at four valentine writing ideas to help cultivate your little one’s writing ability. Introducing a themed writing center is one way to rejuvenate a tired center that may not be getting a lot of use. 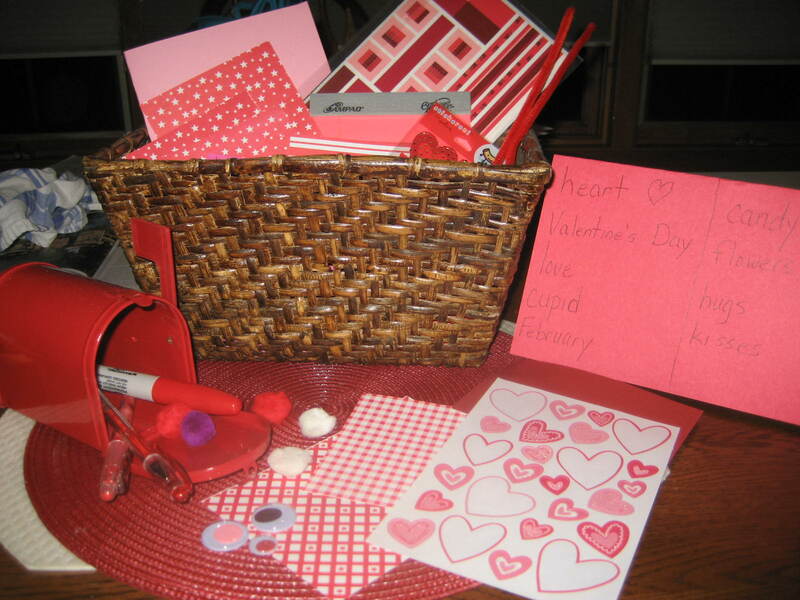 For Valentine’s Day, why not add the following materials to your child’s writing center. I love to get mail that isn’t a bill or a credit card application. How about sending a postcard to a special someone? A little creativity and a 32 cent postcard stamp will get you on your way. The front of this postcard was made with cardstock stamped with heart cookie cutters dipped into paint. 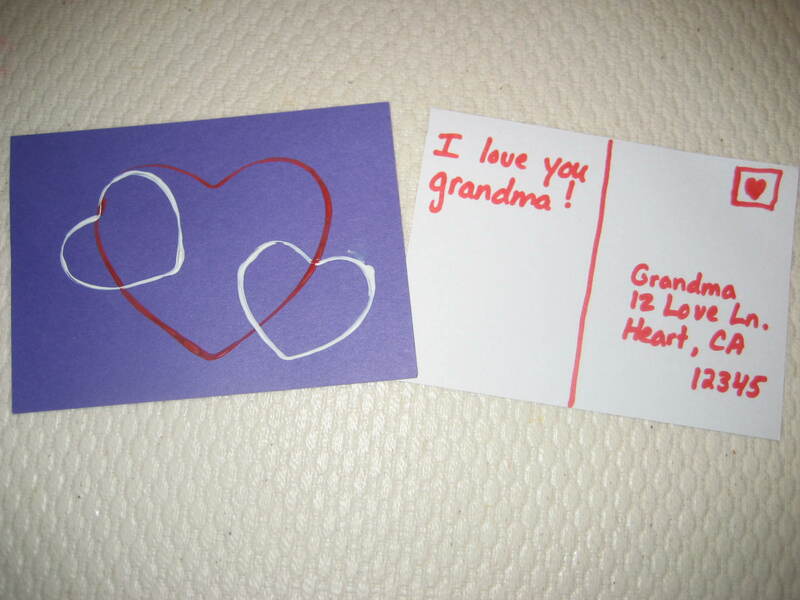 You will really touch grandma’s heart with this handmade card. For the front of the card, have your child draw or cut out a picture of a heart. Next, have them put their fingerprint right in the middle of the heart. On the inside of the card, have the child list things that are special about the card’s recipient. Sign and date the card and you are ready for one special delivery. I love to browse through gardening catalogs and daydream about my fantasy garden. One of my favorite catalogs is White Flower Farm. As I was browsing the pages of beautiful annuals and perennials, I came up with this idea to recycle the catalog once I’m done with it. Draw or cut a heart and glue to the front on a folded piece of construction paper. 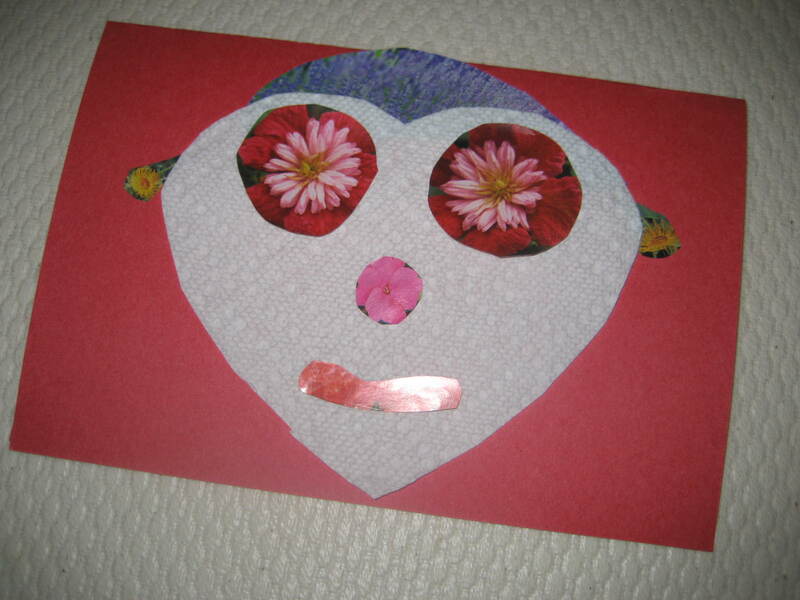 Next, cut out lips, eyes, nose, ears and hair from flower pictures. How about tulips for lips or clematis for eyes? Arrange the face cut-outs and glue down. Now, your child is ready to write a sweet message on the inside. I hope you are inspired to do some writing with your kids. Just a quick THANK YOU for linking up last week with Thrifty Thursday, and I hope to see you again this week! I love the postcards…this is a really great activity idea! I LOVE the themed writing center! I will be setting that up for all of next week–my daughter will be thrilled! Thank you so much for linking up at Teach Me Tuesday — I can’t wait to see what you are up to next week!